What Countries Are Buying U.S. Oil? Following a 40-year ban on U.S. oil exports that was lifted in December 2015, more than 87 million barrels of crude oil have been shipped to 17 countries in the first half of 2016. 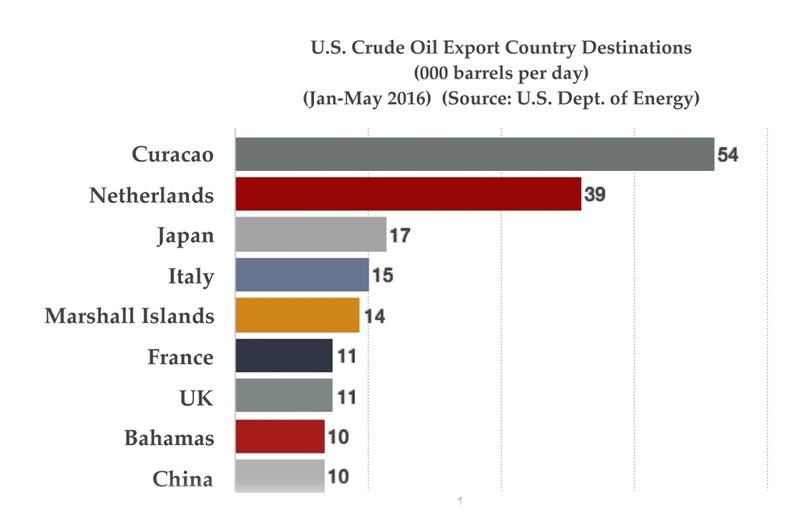 The largest and most consistent U.S. crude oil export destination for the first five months of 2016 has been Curacao, an island nation located in the Caribbean Sea north of Venezuela. Refineries on the island nation owned by a state run Venezuelan company, mix the higher quality U.S. crude oil with lower quality crude oil from Venezuela in order to re-export more easily to other countries. In response to the Arab oil embargo, the U.S. imposed regulations in 1975 that restricted the exportation of crude oil. For years, oil companies and industry leaders have sought a relaxation of the export restrictions in order to compete in the global oil markets. U.S. oil exports are now directly competing with cheap Russian oil exports, which has been aggressively pursuing oil trading relationships from China to Belarus. Another factor affecting U.S. oil exports is how oil is actually paid for. For decades oil has been traded internationally with the U.S. dollar, known in the oil industry as petrodollars. However, over the decades there has been a growing reluctance by many countries having to rely on the U.S. dollar to trade oil, especially China and Russia. So there has been a growing movement to de-dollarization oil trade internationally. Just recently, China and Russia forged an agreement to trade oil between their two countries in yuan and rubles only. Russia is now actively seeking establishment of a ruble based pricing system that will reduce the dependence on the U.S. dollar.